This is one of Bob Dylan's darkest albums. He had not released an album of new material in seven years, and 1990's "Under The Red Sky" contained largely good-time pieces of bluesy fun. Here, we have a Dylan accepting and expressing awareness of his own mortality. He again uses "Oh Mercy" producer Daniel Lanois, who is a producer with a liking for a deep, sombre sound. This production seems to fit with Dylan's often reflective, deep lyrics. However, it has a bit of an intransigent feel to it. It doesn't breathe much. Critically, however, it was an album that had many purring and reclaiming Dylan as their Messiah after a long sojourn. The washed-out old has-been was now the wise old sage. The tracks seem to follow a slow track/upbeat blues track pattern. 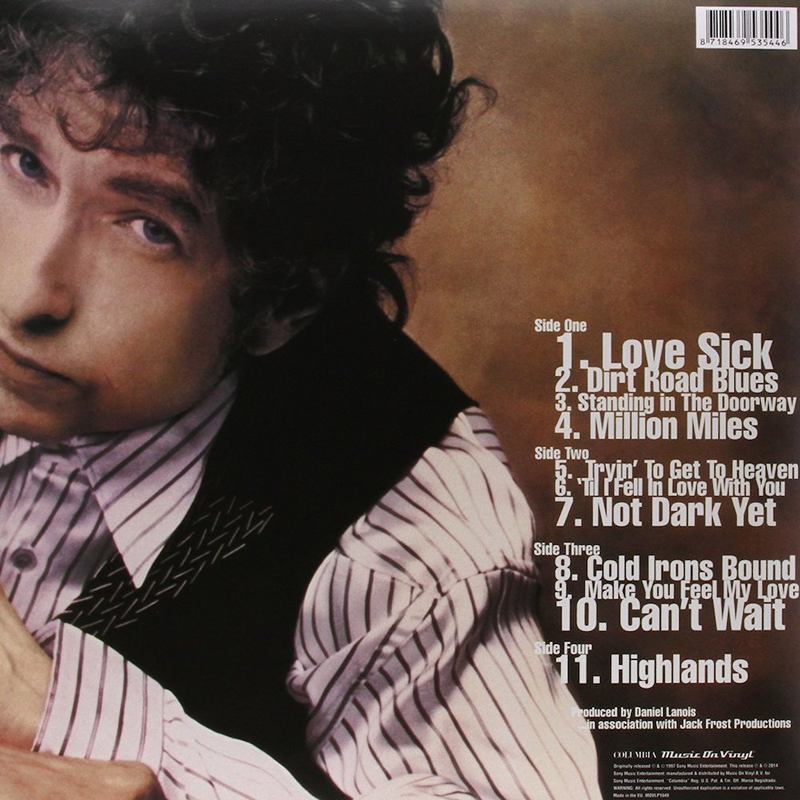 The reflective, shuffling "Love Sick" is followed by the lively "Dirt Road Blues" and then we get the walking pace, dead slow, mournful "Standing In The Doorway", which sounds like Dylan is about to give up on it all. "I can hear the church bells ringing in the yard, I wonder who they're ringing for...". He sounds tired and old. Ironically, many of the albums he has produced in the wake of this one have found him in a much livelier frame of mind. "Million Miles" is a mysterious-sounding, swampy blues, with an addictive bass sound and a convincing, croaky Dylan vocal. It was on this album that we saw that gruff old man's vocal appear that would dominate all his albums post this one. There was a different perception of Bob Dylan after this album. He was now credible again. "Trying To Get To Heaven" is an update on "Knocking' On Heaven's Door" and is a moving, melodic slow burner with tones of the "Oh Mercy" material about it. "I'm trying to get to Heaven before they close the door..." sings a sad-sounding Dylan. It is a most evocative, emotional track. Time for some more blues in the grinding, insistent "Till I Fell In Love With You". Juxtaposing the yearning, sad songs with the more bluesy, upbeat ones is a good idea. "Not Dark Yet" is the album's finest track, for me. A deeply moving, dignified song reflecting Dylan's feelings upon ageing. "It's not dark yet, but it's getting there...". As I write, twenty-one years later, Bob Dylan is still here. When he wrote that song, he was four years younger than I am now. "Cold Irons Bound" is an electric, rocking blues full of intense atmosphere. "Make You Feel My Love" is now well known to many due its being covered by Adele. Dylan's original is a beautiful haunting love song and seems destined to be a much-covered classic. It does, however, sit somewhat incongruously with the rest of the album's material. "Can't Wait" has an appealing guitar underpinning its slow rhythm. 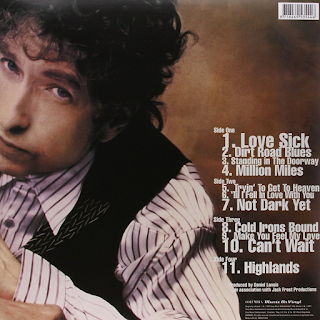 The final track is the longest track ever recorded by Dylan, the sixteen minute "Highlands". It is a slow, regular paced song with a reflective mood to it. It just keeps going. There is no real story to it, though, unlike some of Dylan's other longer songs. Despite its length, I don't tire of it as it goes on its way, possibly because it is absolutely jam-packed with memorable couplets. 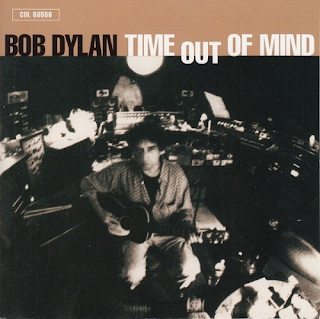 This album proved to be a real turning point into the final creative phase of Dylan's career. Strangely enough, despite its strong reputation among critics, it is not an album I return to as much as I do others. That doesn't mean it lacks quality, though. Far from it.